Anaheim, Calif., Sept. 28, 2017 – Hyundai Motor America debuts the all-new 2018 Accent at the 2017 Orange County International Auto Show. 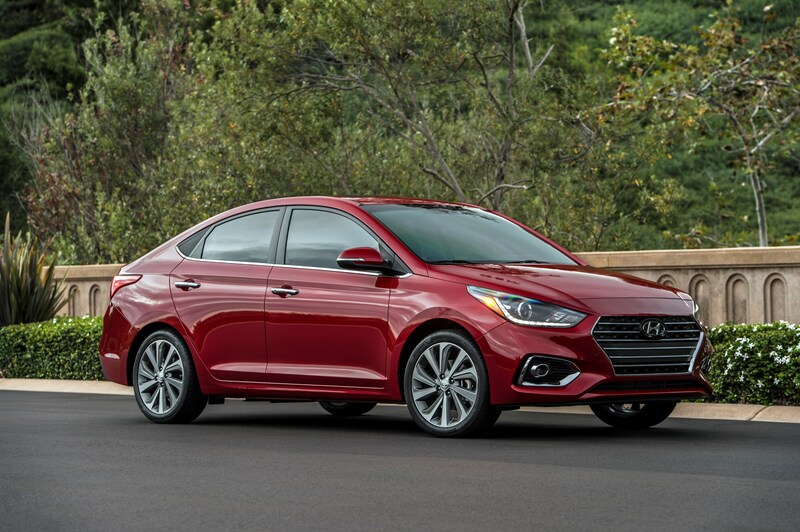 The 2018 Accent enters its fifth generation by building on the strengths of its predecessors with Hyundai's modern engineering prowess. The result is a car with an expressive design, a high-tech interior, a more efficient powertrain, reduced cabin noise and remarkably improved driving dynamics. The company also infused its newest subcompact car with the latest safety and convenience features. The 2018 Accent will arrive in Hyundai dealerships in the fall of 2017. The all-new Accent was developed to be the segment benchmark for driving dynamics and safety while delivering outstanding fuel efficiency and maintaining Hyundai's unbeatable value position. Key to achieving those goals was the car's use of Advanced High Strength Steel. Accent is composed of 54.5 percent Advanced High Strength Steel-up 13 percentage points from the fourth generation-from the company's captive Hyundai Steel plant. In addition, Accent's torsional rigidity improved by 32 percent. Improved ride comfort, handling and stability are achieved through key developments in the suspension. Accent's steering feel has been refined with improvements to steering efficiency, while enhancements to handling and ride comfort have been made by raising the rear roll center and increasing the leverage ratio of the rear shock absorbers. The standard Motor-Driven Power Steering (MDPS) system instantly adjusts to changing driving conditions for greater precision and steering feel while improving fuel economy. 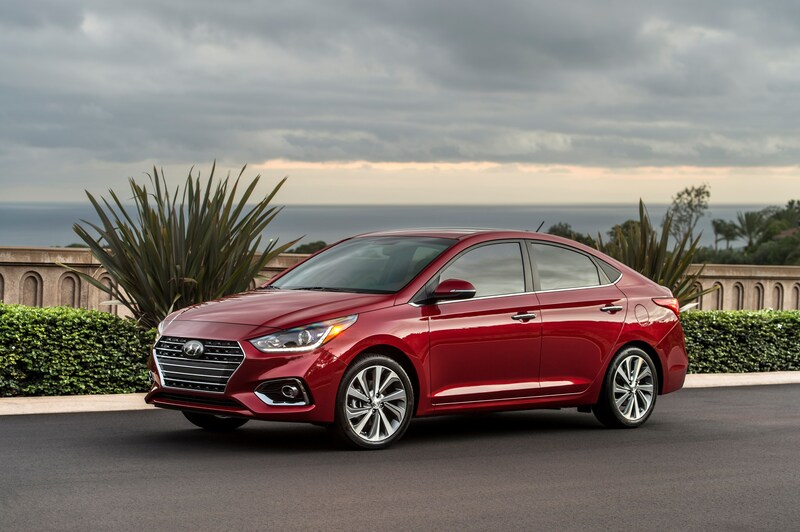 The design of the new Accent exhibits confidence and sophistication with sculpted body forms and smoothly contoured lines delivering a new interpretation of Hyundai's signature design language. The car features Hyundai's cascading grille, a visual signature integral to the company's identity. The grille is flanked by wraparound headlights and available LED signature daytime running lights. Accent's sweeping roof profile and sharp character lines run the length of the car. These character lines meet available slim LED wraparound taillights. Features such as 17-inch alloy wheels and side mirror LED turn signal indicators add to the upscale feel of the car. The car's form is also functional, achieving balance between design and engineering for standout styling with aerodynamic improvements. The underside of the car is also sculpted for aerodynamics, and a new front-lip spoiler, together with a lower ride height, contributes to Accent's efficient design. All of these attributes allow the 2018 Accent to slip through the wind with a 0.28 coefficient of drag. Accent's interior continues the modern, confident, sophisticated look seen on the exterior. A driver-oriented layout with intuitive controls combines with improved interior roominess, high-quality materials and premium technology features to raise the standard for subcompacts. Premium, soft-touch materials in key points create an inviting and comfortable environment for the driver and passengers. For 2018, the new Accent receives an updated powertrain tuned for better fuel efficiency and drivability. 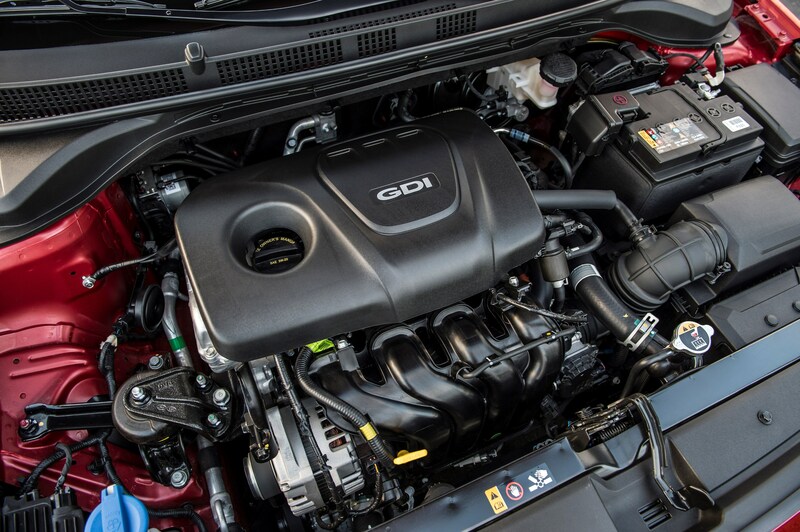 The updated 1.6-liter Gamma four-cylinder Gasoline Direct Injected (GDI) engine produces 130 horsepower and 119 lb.-ft. of torque. Compared with the previous-generation Accent, the engine's powerband has improved, with increased low-end torque to make drivability easier. The 1.6-liter Gamma four-cylinder GDI engine is paired with either a six-speed manual transmission or a six-speed automatic transmission. Fuel efficiency has also been improved by an estimated 7 percent overall. In the engine, components such as low-friction piston rings, a variable fuel pressure module and upgraded software for the engine control module improve overall operation. Further, improvements to the return springs in the braking system have reduced drive friction. The automatic transmission has also been redesigned to reduce the unit's overall weight by 4 pounds and improve operational efficiency. In addition, Accents with automatic transmissions include the company's Drive Mode Select feature to adjust both powertrain performance and steering calibration, allowing the driver to customize the driving character by selecting two modes-Normal or Sport-by simply touching a button on the center console. The 2018 Accent features several improvements to the front side members and inner side sill for improved collision protection. The front crumple zones have been increased, front side airbags have been upgraded and reinforcements have been added to improve the car's collision energy management performance, especially in small overlap crashes. For the ultimate level of convenience when it comes to remote-starting a car on a bitterly cold winter morning, Hyundai has its new Blue Link integrations for Amazon Alexa and Google Home. These integrations work by a customer simply asking an Alexa-enabled or Google Assistant–enabled device, like an Amazon Echo or Google Home, to start their car. The interaction actually sounds like this: "Alexa, tell Blue Link to start my car at 80 degrees" or: "Okay, Google, ask Blue Link to start my Accent and set the temperature to 72 degrees." To send commands to Hyundai vehicles via Alexa or Google, users must enable the Blue Link integration in their Alexa or Google Home app, available on iOS and Android devices, and then link their existing Blue Link account within the Alexa or Google Home app. Voice commands will be sent to Hyundai vehicles only after Alexa or Google Home prompts owners for their Blue Link Personal Identification Number (PIN).